The first SmackDown after Survivor Series 2017 had Kevin Owens and Sami Zayn all over the episode, as the fallout from their interference in the show's main event began. The show's main storyline was whether the duo would be fired by Shane McMahon and Daniel Bryan, with the duo featuring in the main event, a Lumberjack match against Kofi Kingston & Big E from the New Day, whilst the show's other big story included the debuts of Ruby Riot, Sarah Logan and Liv Morgan and their appearance during a SmackDown Women's Championship match between champion Charlotte Flair and Natalya. But was it any good? Let's take a look! As an opening segment, Daniel Bryan saving Kevin Owens and Sami Zayn from being fired and setting up a Lumberjack match main event did it's job. It had elements of drama and built well to Bryan's interruption of Shane McMahon, gave us a main event to look forward to, as well as a storyline that would run throughout the show in multiple backstage segments. That being said, not everything hit it's mark. The main thing that didn't work brilliantly was McMahon coming out and talking up how well SmackDown performed at Survivor Series, despite losing the Series 4-3. Honestly, (and here's a niche reference) it reminded me of my football team, Walsall's manager, Jon Whitney during post-match interviews, trying to make excuses and putting elements of performance over results. McMahon came across as a bit of a loser and he would've been better off flying into calling out Owens and Zayn to get over how furious he was at their interference. Zayn however was on excellent form as he hammed it up, clearly enjoying his recent character shift, whilst getting a strong reaction when being told to "Shut up" repeatedly by Daniel Bryan. A solid main event, that soldiered along with a simplistic story and featured a wild finish. The idea that the lumberjacks were willing to attack Sami Zayn or Kevin Owens, but that Big E and Kofi Kingston had a pass was put over early and continued to be the theme throughout. 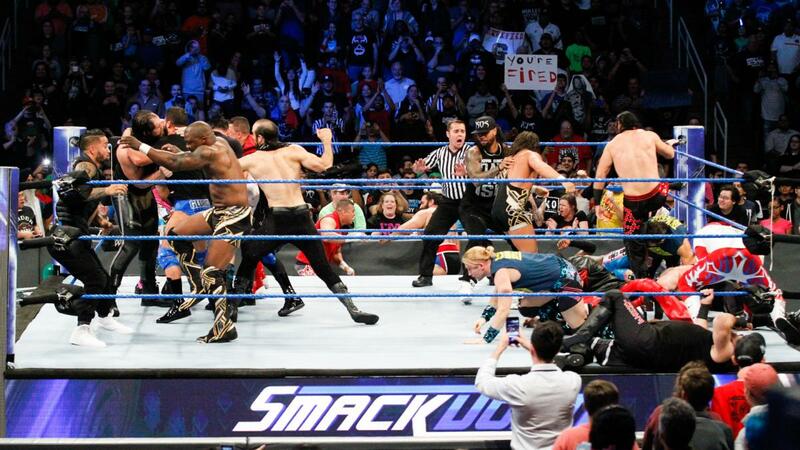 It was a logical narrative, following up from Survivor Series, but it could have been improved by using Rusev and Aiden English as rebellious lumberjacks, because having Owens and Zayn fighting against the entire roster risked turning them babyface, through the sheer odds stacked against them by those in charge. Whilst the commentary team was saying weird things like "Sharks don't have hands, Saxton", the tag team action was decent and basic, highlighted by Big E's wonderful hot tag sequence, all belly to belly suplexes and big splashes. The finish seemed to come out of nowhere though with Kingston sending Zayn to the outside onto a group of lumberjacks and after a Baron Corbin punch aimed for Zayn connected with Bobby Roode, a mass brawl broke out and rolled through the ring with everyone seemingly getting involved and when the dust settled, Zayn took advantage and got a roll-up on Kingston for the win. Thinking about it there was more than a few similarities between this finish and the one seen on RAW in Manchester a few weeks ago when The New Day's invasion caused Cesaro & Sheamus to walk out with the RAW Tag Team Championships! 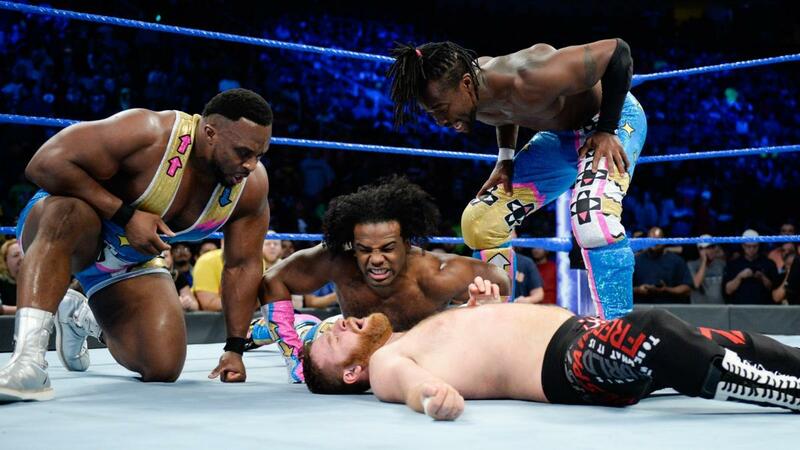 After the match, The New Day circled on Kevin Owens & Sami Zayn, but after Owens escaped through the crowd after a little help from Rusev, Zayn ended up taking the brunt of the attack, as The New Day got their revenge and seemingly brought their involvement in the storyline to an end...The show closed with Kevin Owens on his knees backstage begging Daniel Bryan for his job, before getting booked in a match with Randy Orton (who Shane McMahon had mentioned he'd had to send home because he was so furious with Owens & Zayn in the opening segment) for next week. Before Liv Morgan, Ruby Riot and Sarah Logan interfered, Charlotte Flair and Natalya were actually having a pretty good SmackDown Women's Championship, in front of a crowd that was invested in Flair as the champion. A wicked sitout powerbomb, a long spell in the sharpshooter for Flair and a cool combination backbreaker and flatliner into the top turnbuckle combination from Charlotte, lead us into a Natalya spilling to the floor following a spear and the introduction of the three most recent NXT graduates as they jumped Natalya on the floor. After the match, Ruby Riot, Liv Morgan and Sarah Logan battered Natalya on the outside, before turning their focus to Charlotte Flair, taking turns to hit some signature offence on the SmackDown Women's Champion, in a mirror image of Paige, Mandy Rose and Sonya Deville's appearance on RAW the previous evening. It was no surprise to me that out of all of the losers from Survivor Series, AJ Styles did the best job of addressing his loss in a promo. Styles talked about how despite the praise he'd received for his effort in the match, there were no prizes for second place. It was refreshing to see acknowledgement of disappointment and it makes Styles even more of a likeable babyface, whilst a reference to Rocky II and a potential rematch with Brock Lesnar means that if that match comes around again it will feel even more electric than the first time round. Jinder Mahal decided to turn up on the screen and tell Styles that he was "up here" again, despite Styles already staring at the ramp...someone should really tell Mahal that the screen isn't on the ceiling. Mahal's promo was shaky and garbled, but the long and short of it was that we're getting Styles vs. Mahal for the title at Clash of Champions on 17th December. I was hoping we'd get the rematch on television and a bigger, more interesting clash for the final PPV of the year,. but what are you gonna do? The segment concluded with the Singh Brothers attempting to attack Styles from behind, only for the WWE Champion to easily fend them off, nailing Samir Singh with a crowd-pleasing Styles Clash. 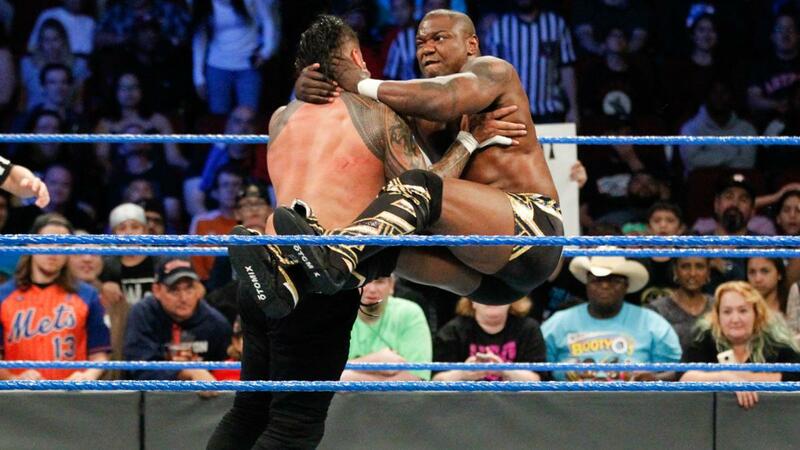 For a match that went less than five minutes on television, I thought this was a great outing from Shelton Benjamin and Jey Uso. The bout featured some hard strikes, a massive leaping knee from Benjamin to knock Uso off the top rope to the floor, as well as a good series of near falls after Chad Gable and Jimmy Uso started scrapping at ringside, before Benjamin was able to pick up the win with Paydirt after Uso missed a Superfly Splash. Harper and Rowan murdered Zack Ryder and Mojo Rawley, picking up a quick squash win with a two-man crucifix powerbomb on Rawley. 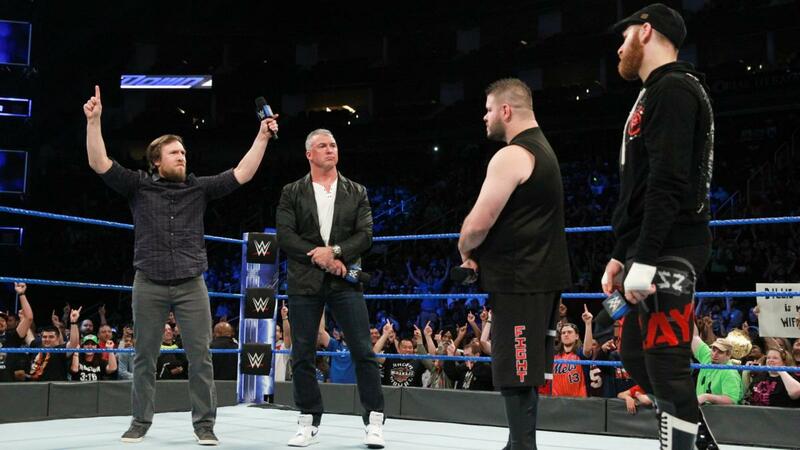 It was cool to have storyline flow throughout a show this week, with the various backstage segments with Kevin Owens & Sami Zayn, Daniel Bryan & Shane McMahon complimenting the moments that book-ended the show involving those guys and The New Day. The addition of Liv Morgan, Ruby Riot and Sarah Logan shakes up the Women's division on the blue brand, although the similarities between Paige, Mandy Rose & Sonya Deville doing the same on RAW are obvious. The two shorter matches were fun with Jey Uso and Shelton Benjamin doing well with their time and The Bludgeon Brothers looking impressive in their intense and dominant debut. Even though I'm not thrilled by the prospect of another Jinder Mahal PPV title match, I wouldn't say there was anything on this show that I actively disliked as a whole segment, being able to find more than a few things I liked about everything that went down this week. With just three more episodes before Clash of Champions I'm looking forward to seeing how the brand goes about fleshing out that card with only AJ Styles vs. Jinder Mahal currently scheduled.